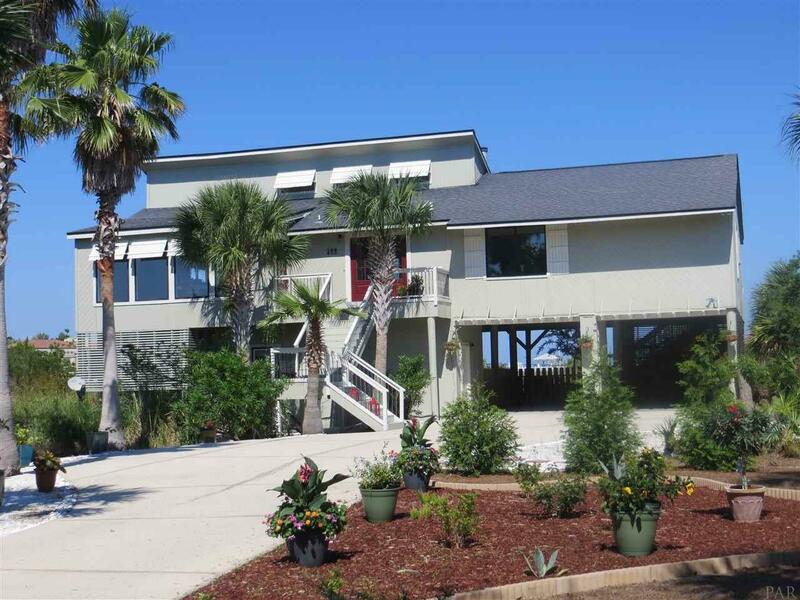 Looking for spectacular views in Gulf Breeze Proper? This beautifully updated home offers the best of all worlds- expansive vistas of the sound and sawgrass and the privacy of a quiet cul-de-sac. Upscale finishes pair perfectly with the relaxing ambience of this Deer Point retreat. From the hand scraped teak floors and African travertine fireplace hearth to the huge chef's kitchen with Viking gas range, you'll appreciate the quality. You'll also appreciate the open floor plan and walls of windows. The full length screened porch is ideal for enjoying your morning coffee, and relaxing in the hammock at the end of the day. The master bedroom also has stunning views and an en suite bath with jetted tub and large walk in closet. Need extra room for guests? The downstairs âcasitaâ offers a living area, two bedrooms, kitchenette, full bath and has its own separate hvac system. Don't miss out on this spectacular opportunity to own the Florida lifestyle and it's convenience to Gulf Breeze schools, world class beaches, medical facilities, shopping and restaurants.